Robert Klippel was honorably discharged from his duties as an able seaman in the Royal Australian Navy on 22 February 1946 (Service Record No: S3211). Soon after, he enrolled to study art at the East Sydney Technical College under the provisions of the Australian Government’s Commonwealth Reconstruction Training Scheme – an initiative to re-establish military personnel into civilian life. What was thought and taught at East Sydney Technical College, the city’s only formal art school in the Forties, was distinguished by a composite blend of selected elements from English and European schools of thought. What the twenty-six year old Klippel absorbed was the then unconventional conviction that art making is an intellectual act – one that moved creativity beyond simply seeing and replicating Nature’s images. In early 1946, something suddenly “just clicked” (an expression that Klippel was later fond of using) and the dyadic interaction between art and the intellect must have struck him as being brazenly radical and also strangely familiar, in that it faintly echoed Sydney Technical College’s founding motto: “manu et mente” (“hand and mind” or “doing and thinking”). For Klippel, it was an exciting and seductive interaction – it brought together form and content and the manual and the mental and it aimed for a confluence of shape and association. In Klippel’s mind, a new ideational mode had been generated – an inventing of form and an investing of meaning. It was a mode that he was to use for the rest of his life. Given War-time shortages, Klippel’s very rare and early three-dimensional artworks, created between 1944 and 1947, were occasioned by the inherent sculptural potential of available timbers – that is, locally obtained exotic woods such as teak, cedar, silky oak, walnut, satinwood and ebony. All of his early hand-carved sculptures are therefore necessarily modest in size, yet they already display finesse and finish. 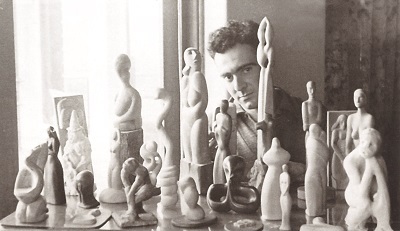 Klippel’s early sculptures in Sydney during this period often display carved and chiselled figural masses somewhat in the manner of the early works of the Polish-Jewish sculptor Jacob Epstein – there seemed little doubt he was also drawn to this famous artistic figure through a shared nationality. Other works of the time show hints of the anatomical elongations of the German Wilhelm Lehmbruck and the surface finishes and organic simplifications of the Romanian Constantin Brancusi, both of whom were very much admired at the time. Already, in Klippel’s early semi-abstract wood sculptures there are suggestions of a keen interest in visual balance and weight distribution, of detailed base and apex interactions and linear surface rhythms. Also, there is much to suggest that he became energised by the dashing artistic example set by the French artist Henri Gaudier-Brzeska – the blazing comet of pre-WWI London and Paris. The effects of this Eurocentric gestation never left Klippel and the quality of these and his later works confirms his place in the same constellation of artists. Klippel’s artistic forms and materials changed markedly after he sailed to London arriving there on 30 April 1947. The collections of antiquities in the British Museum, The Victoria and Albert Museum and the Natural History and Science museums were enlightening and the work of the English sculptor Henry Moore was gravitating. His new friend the Scottish artist Eduardo Paolozzi introduced him to London’s art world and Klippel started to develop a personal visual resource that was to become a life-long interest – he called it a ‘shape-alphabet’. He cultivated a type of ‘visual grammar’ of form and compiled extensive notes on the compositional significance of rhythm, balance, movement, volumes, planes, lines, passages of shape, visual tension and formal cohesion. Thereafter, his work started to display elemental shapes culled from those found in the late-Thirties paintings of the famous Spanish artist Pablo Picasso, as well as those of natural growth processes, geometric shapes and the forms of microscopic life. Klippel quickly came to realize the artistic roles of interconnectedness, inner structure, positive and negative space, as well as the analysis of shape, the importance of spatial relationships and the volumetric suggestions of forms. His researches led him to understand their instrumental place in forming the new and non-naturalistic ‘visual language’ of Modernism. In post-WWII London, the carefully carved organic wooden forms of the recent past were counterbalanced by new free-form abstract components made with wire and metal. His new sculptures asserted spatial interactions and explored the compositional viability of various juxtapositions – wood and metal, biomorphic forms and constructed shapes, internal and external lines of sight, painted and unpainted sections, stability and suspension, upward lines and downward forces. Klippel’s striking artworks of this period brought him considerable attention and success. E.L.T. Mesens, who with Roland Penrose directed the London Gallery, introduced him to André Breton, the eloquent writer, theorist and founder of the Surrealist movement in Paris. Breton, not known for his easy approvals, was impressed enough to introduce Klippel to the Surrealists of the Galerie La Dragonne group and recommend his work to be exhibited at the Galerie Nina Dausset in central Paris in 1949 – his first solo exhibition. Klippel moved to Paris in the same year and his artworks of the time show how he had incorporated Surrealist visuality. Klippel’s ‘shape alphabet’ had already sharpened his formal sensibility and he was quick to grasp and respond to the visual features of Modernist automatism. Scholars now agreed that the conceptual basis of automatism was a remarkable departure from previous ideas in aesthetics. However, Klippel’s use was not based upon the earlier much disputed form of ‘pure psychic automatism’ of the mid-Twenties, but the later more ‘active’ automatism of the Forties, which splayed out the artistic field and used it as a tabula rasa arena for compositional innovation. It was, of course, the seed of Abstract Expressionism - later nourished in American soil. In Klippel’s hands it grew in two directions – like different children of the one father. One direction, in his drawings, favoured the use of a more fluid, looser calligraphic line that suggested polyp-like and cotyledon forms, often with serrations, that sometimes seemed to melt and metamorphose. The other direction, in his sculptures, tended toward the development of an opened-out compositional structure that implied radiating energy and projectile-like outward release. In the artworks of his period in Paris Klippel managed to refine and incorporate elements from Surrealist automatism as well as tashisme and Lettrism, where precise placement and freshly impactful newness were paramount. This synthesis of aesthetic procedures added pictorial and sculptural variety and clarification to Klippel’s art – it was as though a new and rich creative lode had been mined. Thereafter, Klippel was on fire! 1. Notable Australian artists who studied at East Sydney Technical College include: Margaret Olley, Margaret Cilento, Jocelyn Rickarts, Mitty Lee-Brown, Yvonne Francart, Ena Joyce, Tony Tuckson, Tom Bass, John Coburn, Lindsay Churchland, Fred Jessup, Cressida Campbell, Max Dupain, James Gleeson, Fiona Hall, Bert Flugelman, Geoffrey de Groen, Elisabeth Cummings, Guy Warren, Phil Belbin, Hart Amos, Annita Keating, Alex Perry, Guy Masetri, Arthur McIntyre, Reg Mobassa, John Olsen, Ted Prior, Freda Robertson, Martin Sharp, Wendy Sharpe, Alexia Sinclair, Jeffrey Smart, Joshua Smith, Tim Storrier and others. Staff at East Sydney Technical College included the following: John Skinner Prout, Joseph Fowles, Samuel Rowe, Rayner Hoff, Lyndon Dadswell, Barbara Tribe, Arthur Murch, Eileen McGrath, Godfrey Miller, John Passmore, Frank Hinder, Phyllis Shillito, Ralph Balson, William Dobell. Associate Professor Ken Wach wrote the catalogue for the exhibition Robert Klippel: The American and European Years at Galerie Gmurzynska in Zürich in June 2013 – the first Klippel exhibition in Europe for sixty-three years. He was invited to give an address at the exhibition opening at the Baur au Lac Hotel. Robert Klippel is internationally represented by Galerie Gmurzynska in Zürich.